(Rating: 0 / 0 votes) Limitations Full version trial, Game Profile creation/editing works after the trial period expires. Never lose a game save or setting again! Never lose a game save again! Profile, catalogue, backup, move and share data! The world's best & only Game profiler system! gameDentity allows you to give family, friends and any user of your PC (even strangers) their own iDentity for virtually every PC game on (or soon to be on) your computer. 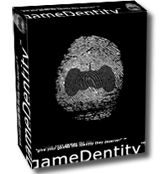 gameDentity is the world's best & only Game profiler, catalogue, backup, transfer and sharing system! gameDentity allows you to give family, friends and any user of your PC (even strangers) their own iDentity for virtually every PC game on (or soon to be on) your computer. In layman's terms it means everyone has their own game saves & settings for any & every pc game played in the gameDentity system! And even if others don't use gameDentity, your game saves and settings are safe and unique, plus they won't interfare with the games standard default game saves & settings prior / after using gameDentity! Many games (old & new) do not include a user profile system (practically all adventure games such as Broken Sword 1-3, Syberia 1-2 to other game genres such as Deus Ex 1-2, Worms Blast etc) and have various ways and places for saving game data & user settings. Not to gameDentity. Each game acts the same and saves in the same place every time, the current playing users very own user profile directory! After which everthing remains in tack even if the game is runned the normal method (outside gameDentity) after use! "I saved over <insert name here>'s game saves by accident! Again!" "You can save in slot 4 & 5, but slots 1 & 2 are mine, Don't FORGET!" "You saved over my <insert game here> game saves! I spent hours trying to unlock that rusty sword, getting that vehicle and saving those 15 gnomes! Thanks a bunch, i'm not talking to you anymore! Well, at least until dinner time." "Who keeps changing the music volume so low and why is the display so small again?" "Now, did I back-up that <insert game here> data before uninstalling it? Did I? I'm sure I did? Oh no!!!" Sorry if you enjoy the above! PS. No Game Data was harmed in the making of this Product!